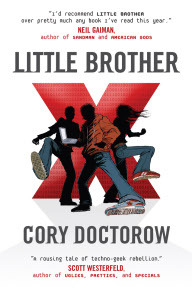 I've just finished "reading" (I actually listened to the audiobook) Cory Doctorow's latest novel: Little Brother (free to download in various formats or buy it from Amazon ). It's a book set in the near future in San Francisco and is "a scarily realistic adventure about how homeland security technology could be abused to wrongfully imprison innocent Americans." Think of it as part geek novel - part George Orwell's 1984. The story is essentially about how this kid fights back against the over-protective surveillance society created by the Department of Homeland Security following a terrorist attack on the Bay bridge. Though aimed at the "young adult" market, I found it very interesting and enjoyable. One thing the novel brought up was the fact that terrorist attacks are designed to instill terror and fear into the minds of those attacked and force them, their societies and governments to live in fear of another attack - live in terror. This made me think about the drastic changes that have taken place in the western world since 9/11, 7/7 (London) and the busted "liquid bombers" plot. Since 9/11 we've seen all sorts of new laws, rules and restrictions imposed on us. Flying is now a real pain in the hind quarters with hand luggage restrictions, super sensitive metal detectors forcing us to remove anything remotely metallic from our beings when passing through airport security (I flew to the US weeks after 9/11 and the metal detectors were picking up the foil on packs to chewing gum), and of course the added confusion and aggravation all these changes introduce. Now I can understand why all these changes have been introduced, and to an extent, I'm sure they have possibly made people feel more secure, but I can't help feel some of these measures are ineffective or just an excuse for companies to make money or governments to put through unpopular changes. As long as there is a will, there will always be a way. Regardless of the amount of security or restrictions applied, someone will always find a way round the current security measures. Thanks to the press, terrorism is currently (though not strictly correct) associated with Islam and Islamic countries. Assuming the press's association is valid, do peaceful (ie not currently in any sort of conflict of their own) Islamic nations fear terrorism like the western world? Are Islamic countries implementing "anti-terrorism" laws and measures like the western world? Do "terrorist nations" fear terrorists, western or otherwise? We never hear about the other point of view in the news. We never hear about drastic changes taking place in what the press would like to call "terrorist countries". Do they worry about it? Should we worry about it? After all more people are killed in the home by household appliances each year than are killed by terrorists, yet most of the western world live in fear of terrorism.